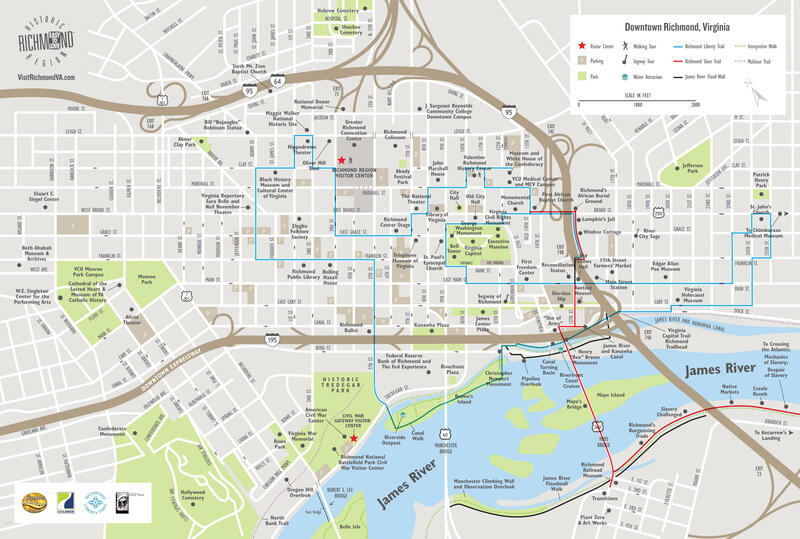 The Richmond Liberty Trail is a walking route that connects many of downtown Richmond&apos;s historic sites, attractions and neighborhoods, including 15 national historic landmarks. This 6.2 mile (10K) trail is marked with a logo painted on the sidewalk. Where the Richmond Liberty Trail meets corners or other locations where direction is needed, supplementary arrows indicate in which direction to walk. There is no beginning or end to the Richmond Liberty Trail. It is a self-guided, continuous loop intended for visitors and residents who want to experience portions of Richmond&apos;s nationally significant history on foot. Participants are encouraged to walk portions of the route based on their interests. For instance, in Shockoe, the Richmond Liberty Trail connects with the Richmond Slave Trail and the Virginia Capital Trail. Inspired by the Boston Freedom Trail project, the Richmond Liberty Trail is a collaborative effort among Richmond&apos;s business, tourism and history communities. The Richmond Liberty Trail provides a foundation for the development of auxiliary routes, thematic tours and partnerships with the Richmond Region education community. To date, the Richmond Liberty Trail is a collaborative, community-led effort with no parent organization. For more information contact Bill Martin, The Valentine, 804.649.0711 x340, or Katherine O&apos;Donnell, Richmond Region Tourism, 804.783.7414.